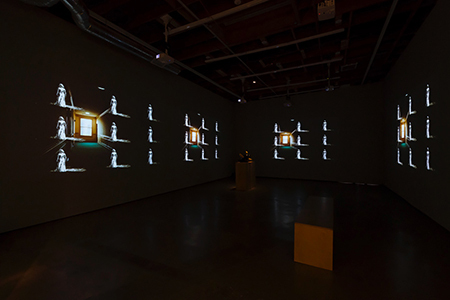 “The Decay of Fiction,” originally released as a 35-mm single-channel film in 2002, has been transformed into a five-channel installation on three walls (two on the longest, and one each on the end and opposite walls), immersing you in a muted spectacle in such a way that it requires a certain amount of twisting and turning to take it all in. And take it in you are compelled to do. In and around the grounds of Los Angeles’ legendary Ambassador Hotel a wide array of scenes and interactions amongst actors are superimposed in filmic semi-transparency onto interior and exterior settings in ghostly luminescence. At times it appears as though characters from the recent past are inhabiting the baggage-laden environs, and at others the actors, by their dress, appear to be of a classic Hollywood vintage and ghosting that era (even while it is apparent that they’re hired acting hands playing vintage actors). Or perhaps it’s just an era free of such timelines. Despite there being a near complete absence of impactful tone — there is no sound track. The most sensational imagery, involving an overweight dude with a hard-on (sometimes masked, as well as tutu-ed), is more bizarrely intriguing than creepy. The ghostly imagery, running at varying speeds, is simply endlessly compelling. The Ambassador’s history is dense to the point of excess. It was the site of early Academy Awards ceremonies, to Robert Kennedy’s assassination in 1968, to being purchased and eventually lost by Donald Trump in the ‘80s, and concluding with its demolition in 2006. Yet “The Decay of Fiction,” especially in this reconfigured multi-channel install, can just as easily be consumed as a more generic old Hollywood-meets-counterculture-meets-performance art, apart from The Ambassador’s mythology. Two sculptures dating from the ‘60s, and several new framed film prints are unwelcome distractions to the main event, but the main event is extraordinary enough to be worth overlooking the market-requisite additions.